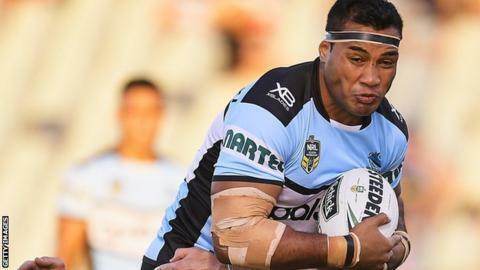 Struggling Leeds Rhinos have signed Cronulla Sharks prop Ava Seumanufagai on a two-and-a-half-year contract. The 27-year-old New Zealander has played 118 games in the NRL for Wests Tigers and the Sharks. Director of rugby Kevin Sinfield told the club website: "Ava is a big player with a great work ethic." Seumanufagai added: "I'm really excited I have been speaking to Kevin for a while and I know a few blokes who have been at Leeds and they have loved it." He said he hoped he would be able to help the club recover from a poor start to the Super League season which sees them bottom of the table with just two wins from their 10 matches. "I know the Rhinos have had a tough start to the new season," he said. "But I have been in teams that have had tough starts before and I know how rewarding it is when you turn your season around and achieve something as a group. "I am looking forward to doing my job. Once the paperwork is completed I will be heading over and I am keen to get started."